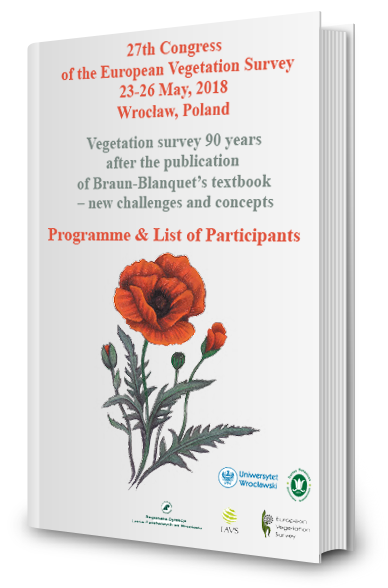 We have a great pleasure to invite you to the 27th Congress of the European Vegetation Survey. to meet your colleagues and to make new contacts. We kindly invite to Wrocław. will be held in Wrocław from Wednesday 23 to Saturday 26 May, 2018. 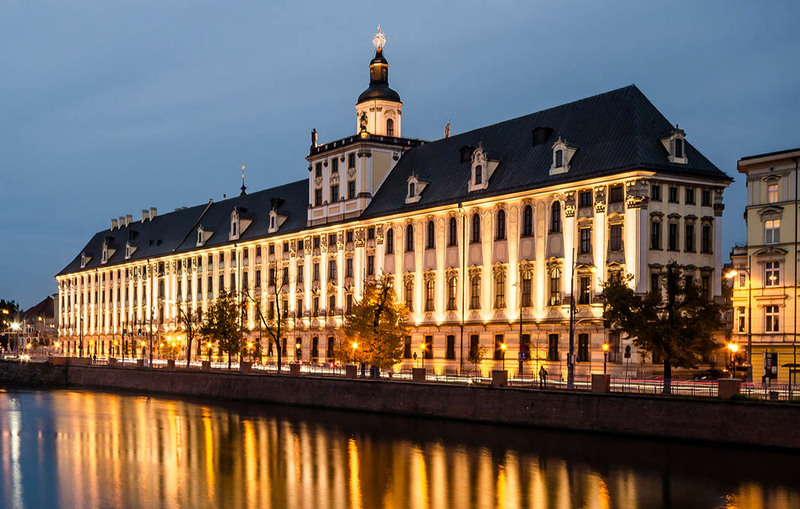 The Congress will be held in the Aula Leopoldina (Opening Ceremony) and in the Conference Centre of Faculty of Law, Administration and Economics (Sessions). - new challenges and concepts. Extending scale in spatial, temporal and environmental dimensions. Plant community responses to changes in management. Vegetation and alien plant invasions. 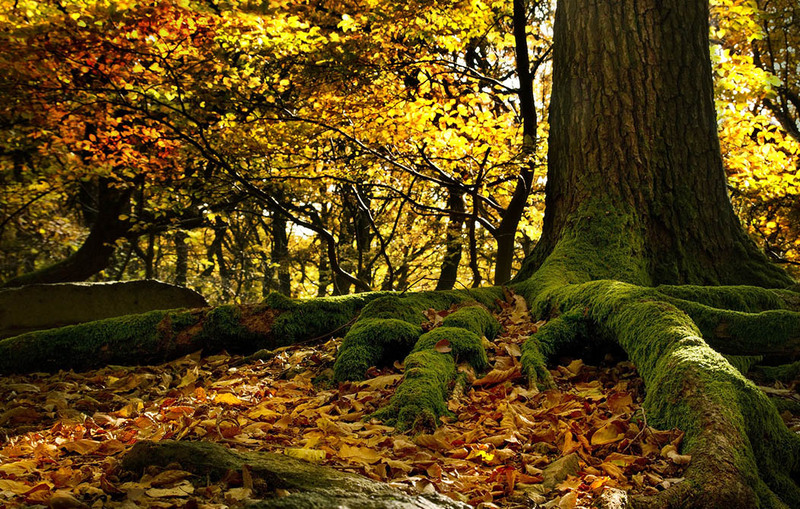 Assessment and conservation of European habitats. Bank and payment details are available here. On the fourth day of the Congress (Saturday) the Congress Participants will participate in one of three excursions. We will leave at 8:00 and return at about 19:00 (20:00). 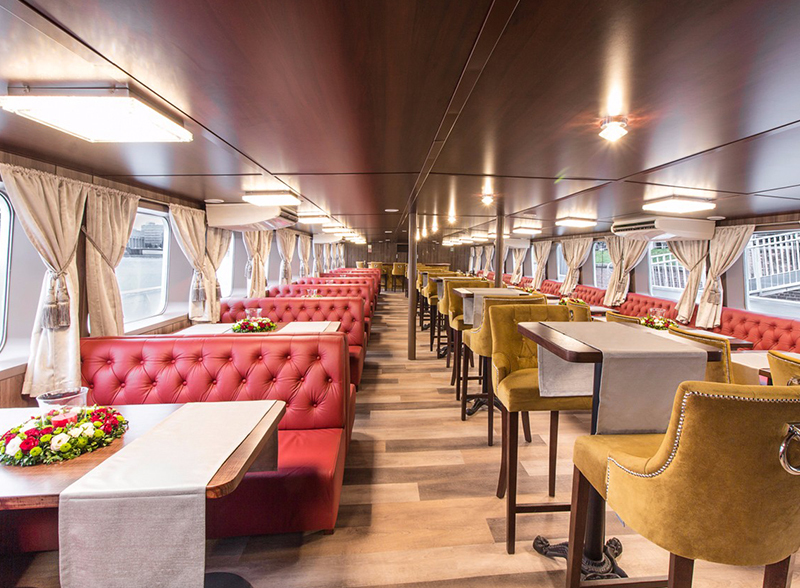 We will provide a lunch and also a written guide of the chosen place. May is usually a warm and sunny month in Poland, however we advise to be prepared for rainy or windy weather. Hiking shoes will be necessary. 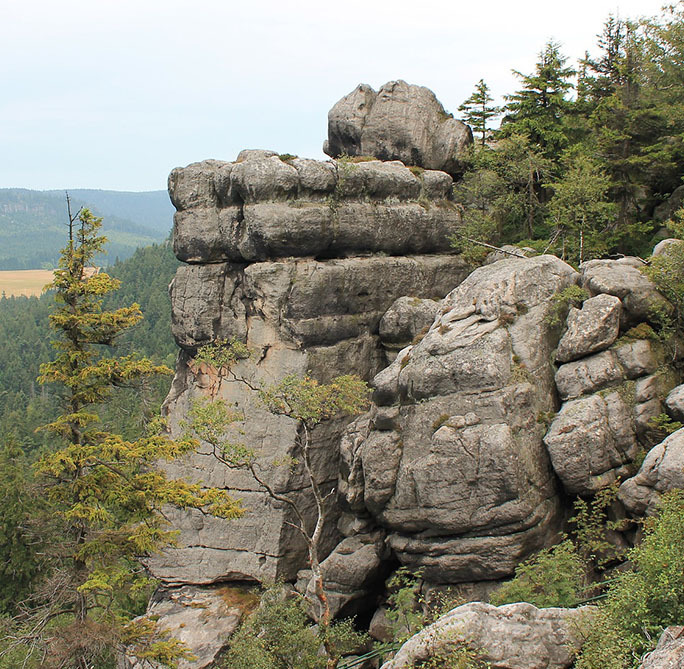 The landscape of the Góry Stołowe National Park is rich with remarkable rock formations, which were carved through eons by weathering of the metamorphic rocks. This kind of landscape is unique in Poland, making the area one of the top tourist attractions of the Sudetes and Lower Silesia. The most interesting are rock formations of Szczeliniec Wielki and Błędne Skały (Rocks Errant), making up a fantastic rock labyrinth. Vegetation of the Góry Stołowe National Park is very diverse due to the heterogeneous landscape and altitudinal zones. Artificial spruce forest is the most widespread vegetation type in the area. 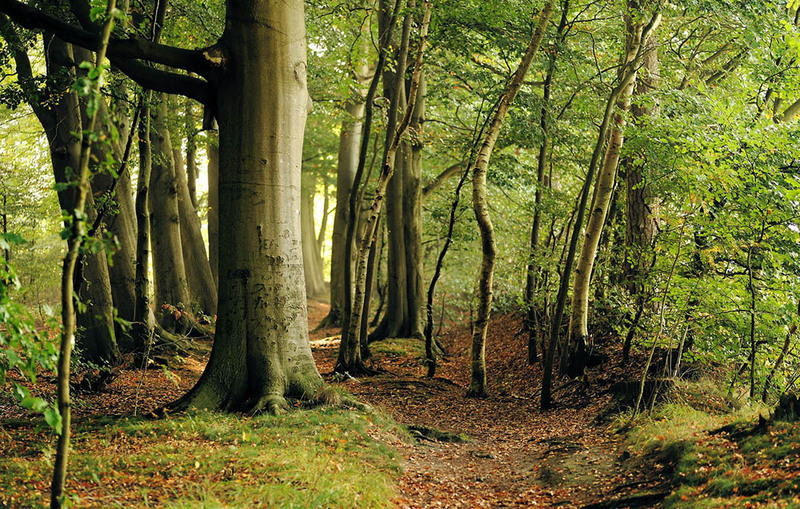 Less common are indigenous beech forests and ravine forests, as well as fir and spruce-fir forests. Semi-natural grasslands constitute one of the most important elements of the cultural heritage of the area. The most valuable are grasslands with rare plant species like Arnica montana, Trollius europaeus and Veratrum lobelianum. Due to the picturesque rock formations located over a flat area covered with grasslands, these grasslands are often compared to the African savannah. The least common but highly threatened habitats are wetlands including peat bogs and mires which occur on the elevated plateau of the Stołowe Mountains. The most noteworthy is the Great Batorowskie peatbog covering the area of about 40 ha. Góry and Pogórze Kaczawskie are known as the „land of extinct volcanoes”. This is one of the most interesting regions of Lower Silesia where we can find traces of volcanic activity, namely Young Palaeozoic volcanism of subsequent type and Cainosoic volcanism of platform type. The effects of the stormy geological past of this region can be still observed in the form of lava coatings and plugs or eruption cones. The most famous is Ostrzyca Proboszczowicka, built from Tertiary basalts, which is also called „Silesian Fujiyama”. This area is characterized by a variety of geomorphological forms and differentiated hydrological conditions which stand for high species richness and diversity of plant communities. 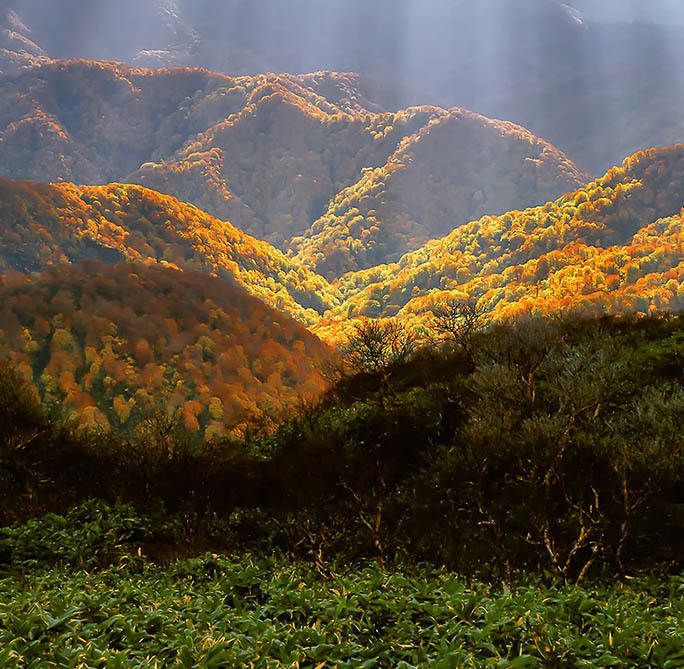 The most valuable are ravine and outcrop forests of Tilio-Acerion, thermophilous oak forests of Quercion petraeae (most of them of coppice origin) as well as mesic, nutrient-rich beech forests of Fagion sylvaticae and rare calcareous beech forests of Sorbo-Fagion. Wet meadows found in this region are habitat of numerous rare species e.g. Trollius europaeus, Gladiolus imbricatus, Iris sibirica and orchids species. A distinctive feature of the vegetation of Góry and Pogórze Kaczawskie is the broad spectrum of rocky outcrop communities from chasmophytic vegetation of siliceous and calcareous rocks, through siliceous screes, up to xerothermophilic pioneer grasslands of calcareous, basophilous or siliceous rocks. Many rare plant species are associated with the above mentioned habitats, for example Asplenium adulterinum (sperpentine specialist) and Trichomanes speciosum (reported only from the Góry and Pogórze Kaczawskie). 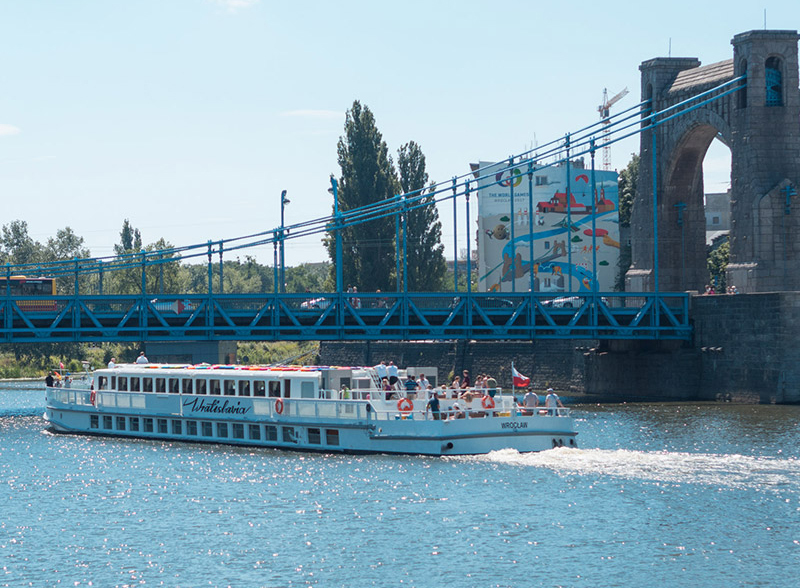 Odra is the second longest river of Poland. Like in other European large rivers, the valley has been changed throughout centuries. Specific land relief and land use system caused that Odra river still inundates thousands of hectares of lands. It caused that large patches of alluvial and riparian forests, as well as species-rich meadows remain up today. 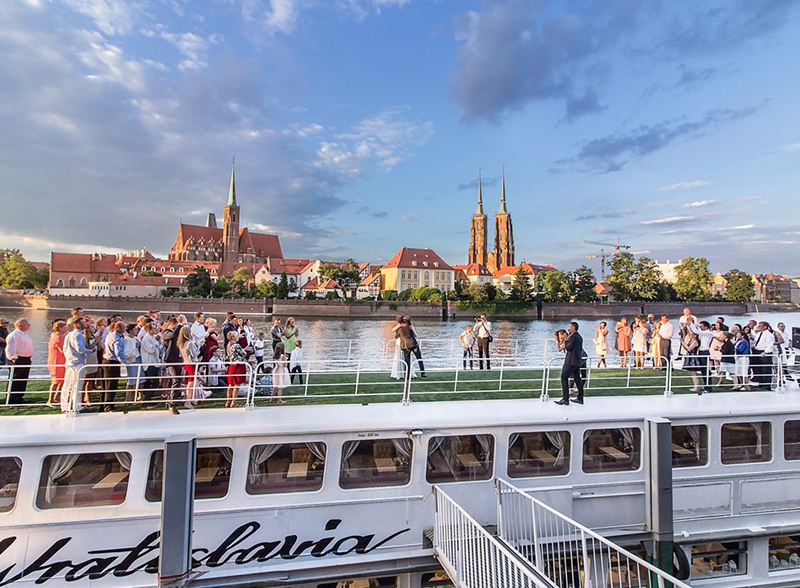 On distance almost 100 km along of the Odra river valley, north to the Wrocław, a Special Protection Area (SPA) and Important Bird and Biodiversity Area (IBA) within Natura 2000 system have been established. Well preserved riparian forest of Ulmenion minoris, alluvial forest of Alno-Padion and alluvial meadows of river valleys Cnidion dubii are common vegetation types. 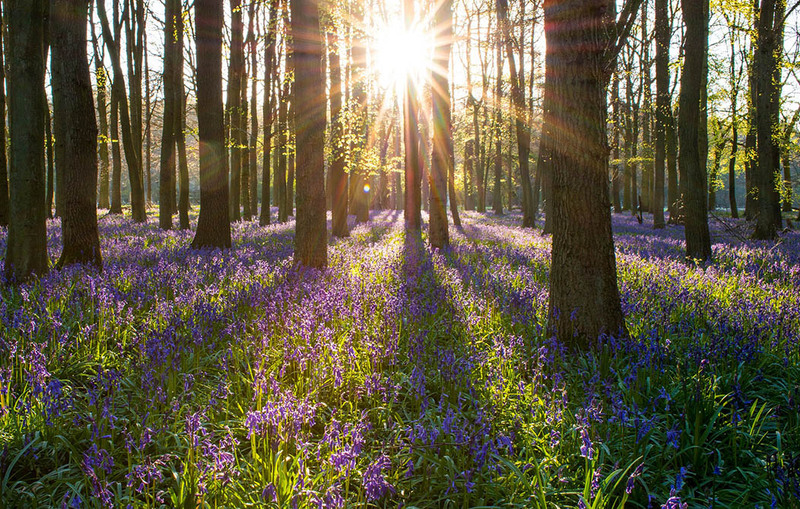 On areas separated by embankments, lowland hay meadows of Arrhenatherion and oak-hornbeam forests of Galio-Carpinetum can be found. 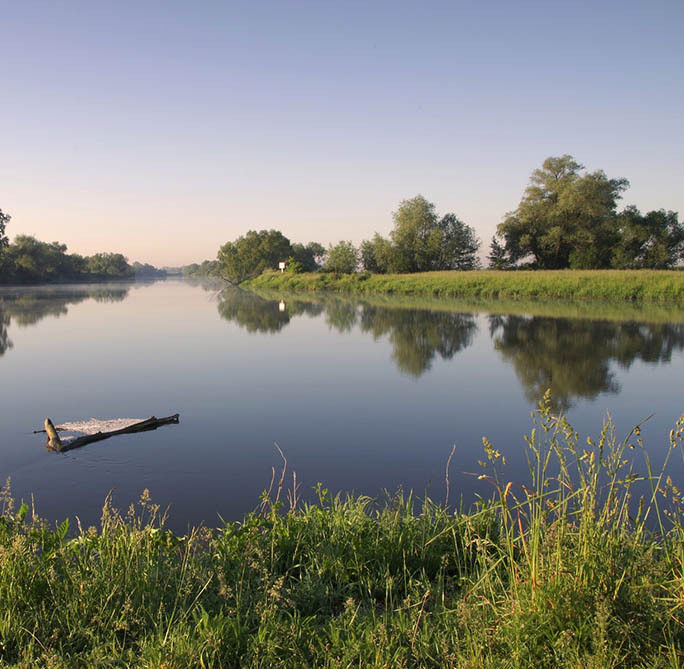 The intense human exploitation of this part of Odra river has begun in the 12th century and was related to the location of the Cistercian monastery. 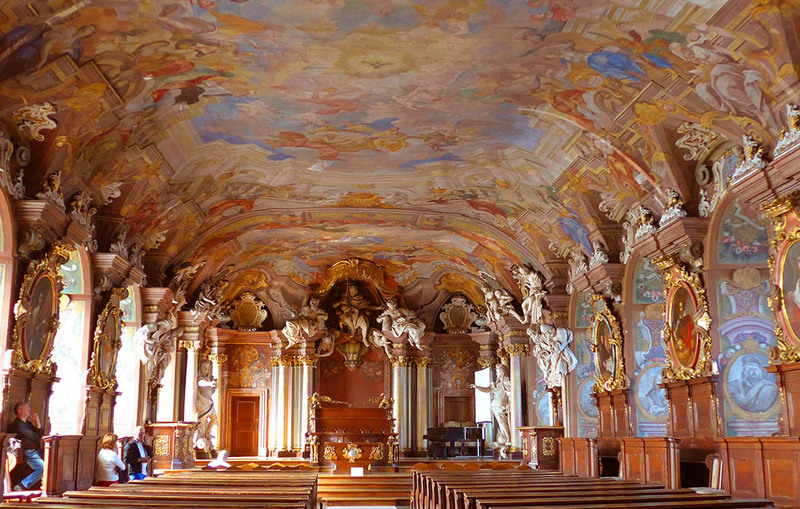 The monastery has been enlarged and re-built in the 17-18th century and today the Lubiąż Abbey it is among the largest sacral buildings of the Europe, preserving in its surrounding unique baroque landscape. 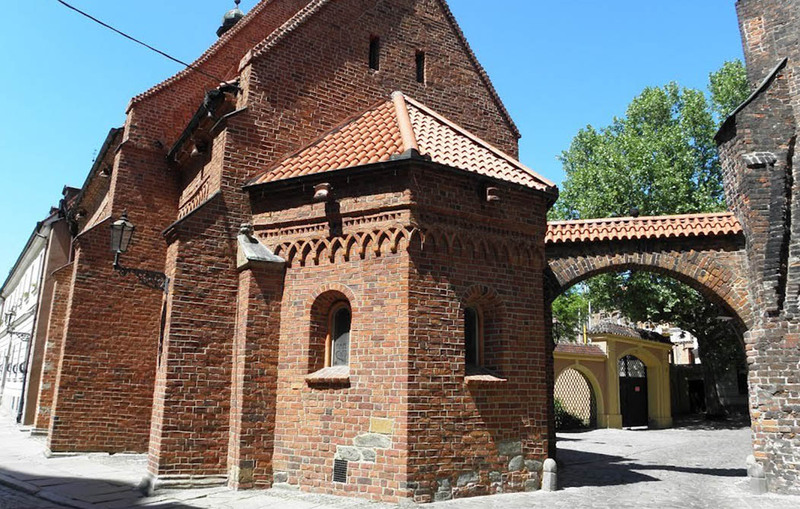 As a part of the trip, a break in the Lubiąż Abbey is planned. 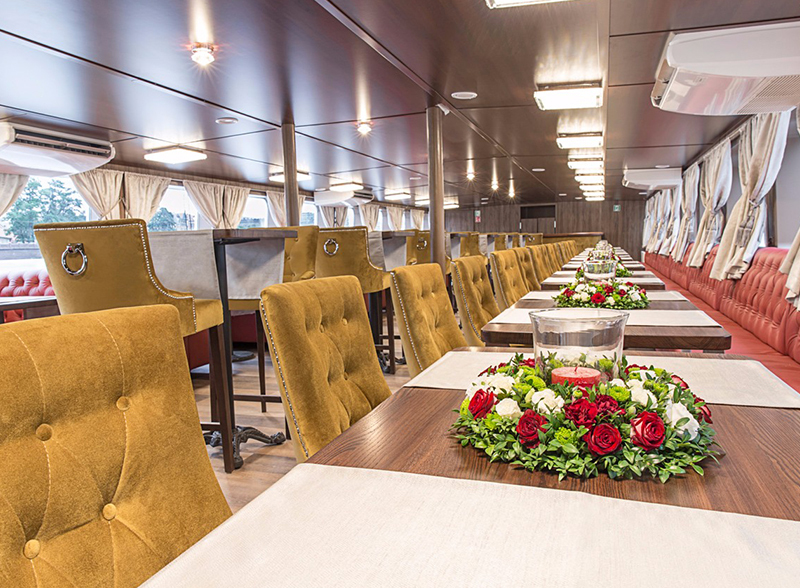 The Congress dinner will take place on the ship, at the restaurant Wratislavia, located on the bank of Odra River at the heart of Old Town. If you need financial support from IAVS to participate at the EVS Congress, you have to apply by filling the specific form additionally to the registration form. Only IAVS members can apply for this support. Please, also read the instructions for "IAVS Financial Support" available on www.iavs.org/Membership/Financial-Support.aspx, point 2. Participation in IAVS Congress (deadline for application for financial support is January 12th, 2018). Please send your application to the following address: ewa.stefanska-krzaczek@uwr.edu.pl. 1. Prepare a motivation letter (maximum 1 page) explaining why you want to attend the EVS Congress, it's possible benefits to your future research, and if applicable, how previous experiences from other conferences have helped your research. Indicate the approximate amount of support (in Euros) you ask for, and which expenses you need to cover (travel, conference fee, accommodation, or any combination of these). State clearly that you have no or only partial financial support from your institution for attending the EVS Congress. Add a preliminary abstract of your talk or poster and a brief CV. 2. The applications form with your data will be handled by the EVS Congress Organising and Scientific Committee and sent to the head of IAVS Global Sponsorship Committee, which will make all decisions about financial support. The selection of grantees and the decision on the amount of the individual travel grants will be based both on the personal merits of the applicants (e.g. abstract quality, motivation, CV) and their needs (e.g. income situation, travel costs to Wrocław). 3. All the applicants will be informed about the decision of the Global Sponsorship Committee by April 6th, 2018. Conference fees and accommodation costs of the awardees will be covered by the IAVS, reimbursement modalities will be communicated only to the applicants later, after the procedure was agreed with the IAVS Secretariat. The organizers of the meeting do not provide booking service for the accommodations of participants. Use this code: EVS2018 Ogród Botaniczny for a 15% discount when making the reservation. 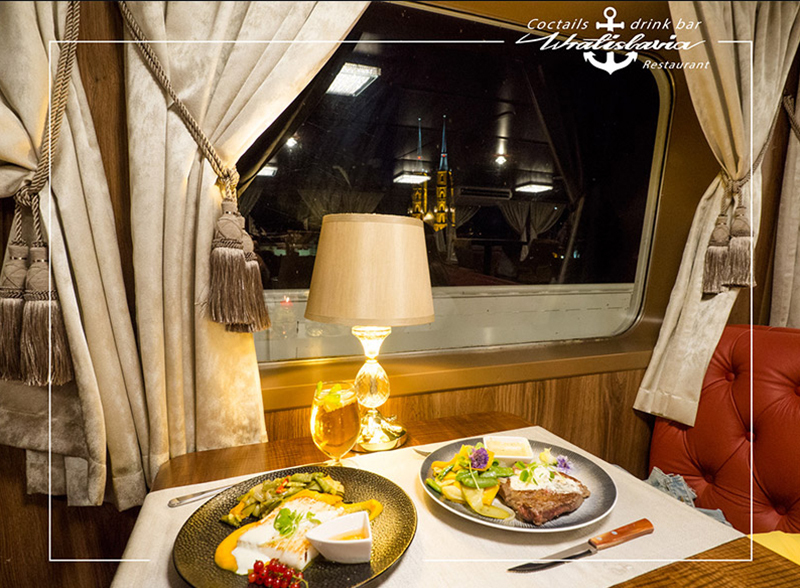 All reservations made with the offer require full prepayment within 3 days of booking. the hotel may charge the guest with the full cost of the reservation. 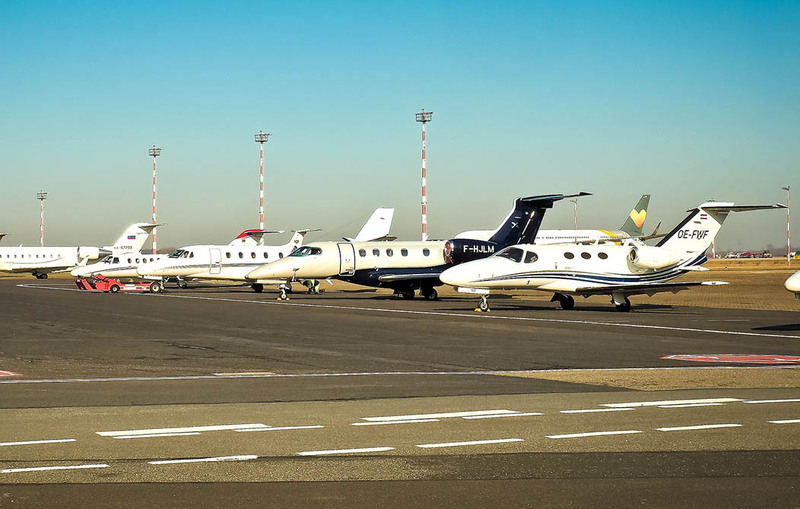 The Wrocław Copernicus Airport is located in the south-west part of Wrocław, about 10 km away from the city centre. 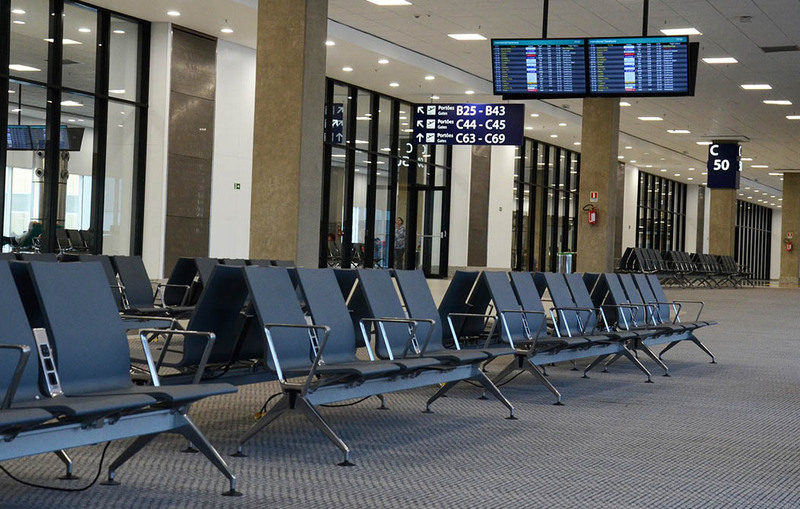 Right now, 8 airlines operate out of Copernicus Airport: EUROWINGS, LOT, LUFTHANSA, Ryanair, SAS Scandinavian Airlines, SWISS INTERNATIONAL AIRLINES, Wizz Air. 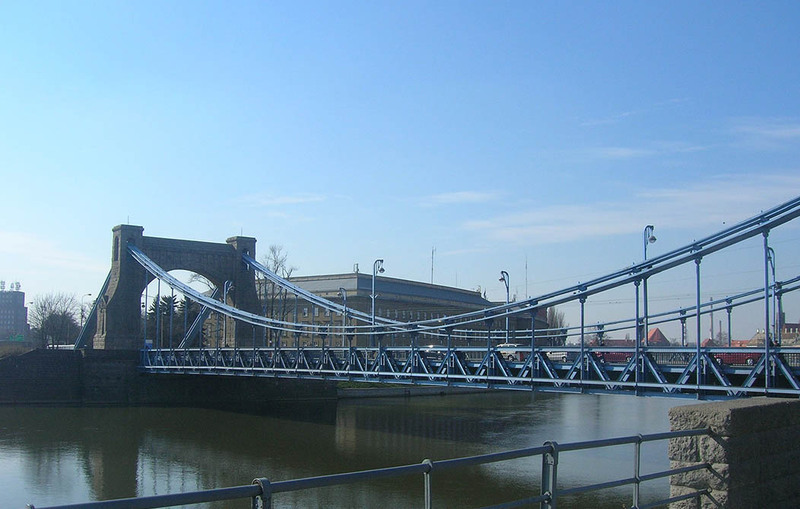 From the airport you can easily get to the city centre. NIGHT BUS NO. 206 operates on the same route through the Airport. (See the detailed timetable). Ryba Taxi, Wicar Taxi, Play Taxi: Airport – City Center – 35 - 40 PLN. * Day rate. Prices may slightly vary depanding on traffic difficulties (jams, detours, etc.). Night rate – according to taximeter. By train - from Warszawa Centralna railway station (Al. Jerozolimskie 54) to Wrocław Główny railway station. 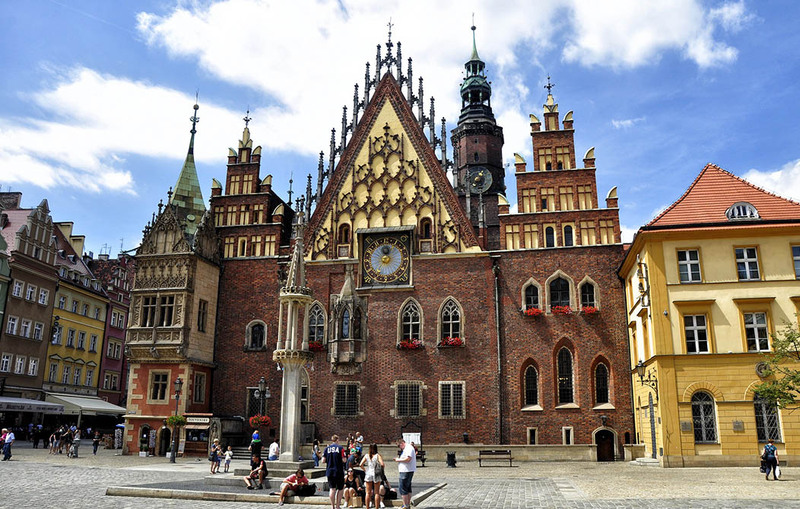 By plane – from Warsaw Chopin Airport to Wrocław Copernicus Airport. By train - rom Kraków Główny railway station to Wrocław Główny railway station. By train - from Katowice railway station to Wrocław Główny railway station. By train - from Gdansk railway station to Wrocław Główny railway station. 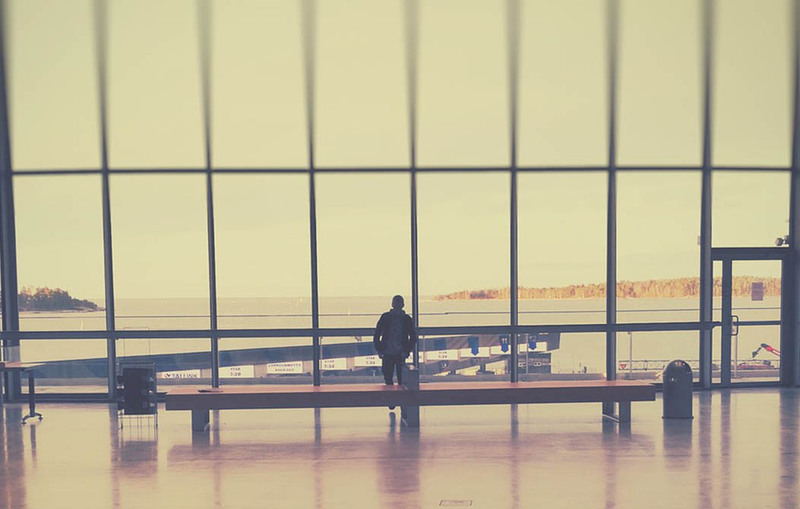 By plane – from Gdansk Lech Walesa Airport to Wrocław Copernicus Airport. Wrocław is the historical capital of Silesia and Lower Silesia. Today, it is the capital of the Lower Silesian Voivodeship. The history of the city dates back a thousand years, and it's extensive heritage combines almost all religions and cultures of Europe. 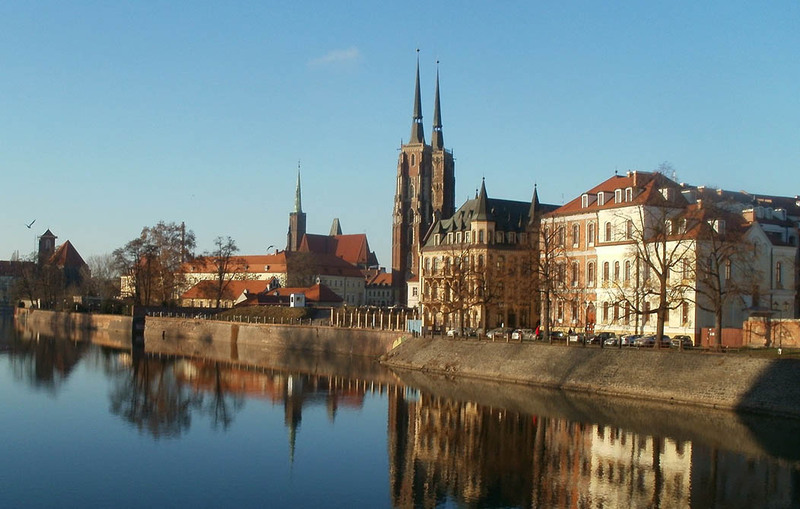 A thriving multicultural centre, Wrocław is home to a growing student community and acts as the financial, cultural and commercial hub of western Poland, hosting a wide variety of music and theatrical events. 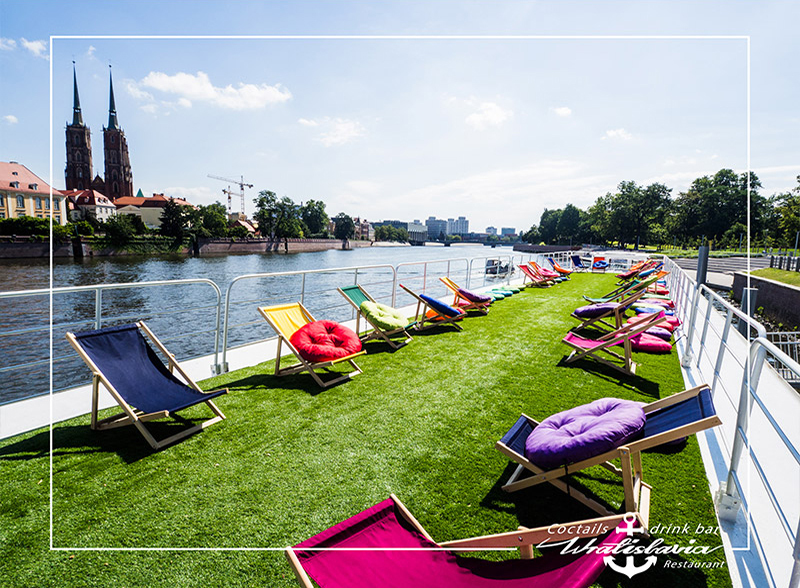 Wrocław is a university city with a student population of over 130,000, making it one of the most youthful cities in the country. 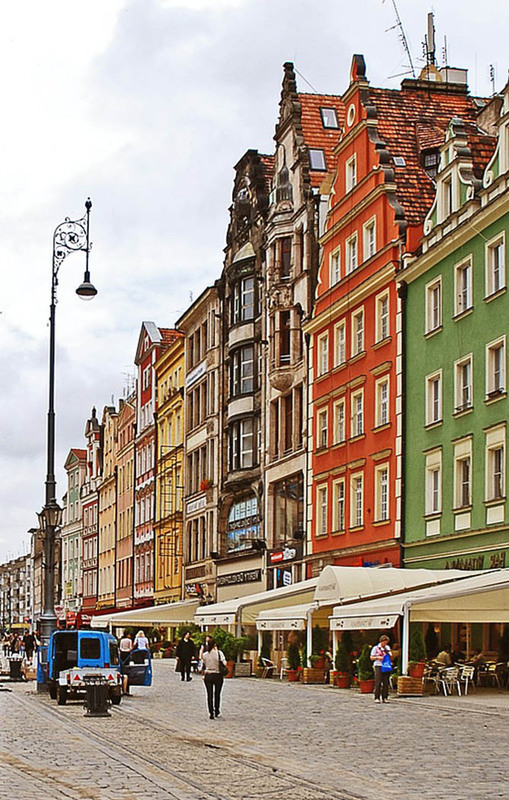 If we think about Wrocław’s city centre in terms of districts, there are three essential areas that visitors shouldn’t allow themselves to miss. 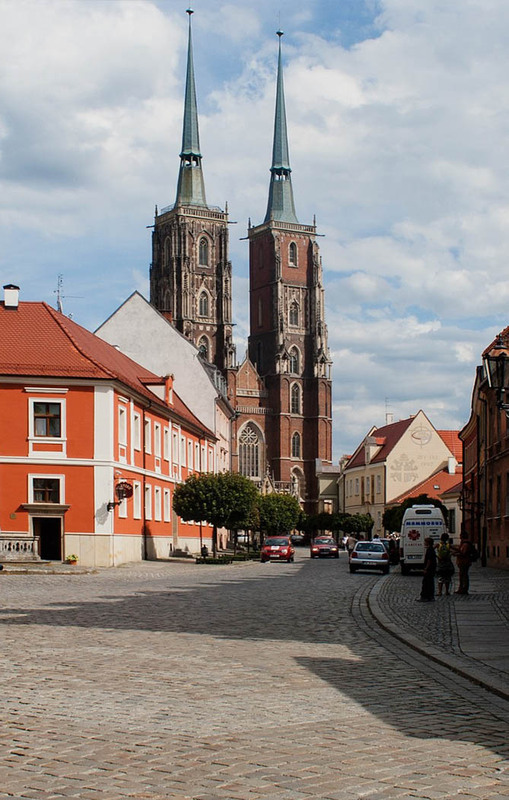 The first is obviously the Old Town, with the marvellously restored Market Square at its centre and its maze of cobbled streets, canals, bridges and church spires. Essentially bound by the Odra River to the north and the Fosa Miejska – or city moat – to the south, this area that was once encircled by the city’s medieval defensive walls is where you’ll find the bulk of Wrocław’s historical monuments and museums, as well as many beautiful University buildings, soaring churches, and the city’s infamous gnomes. 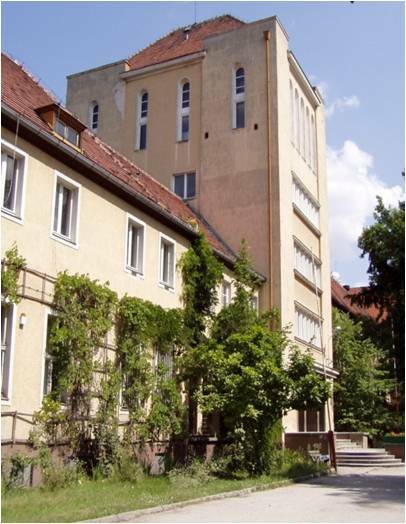 The Old Town also includes the ‘District of Mutual Respect’ – a unique neighbourhood southwest of the market square which includes almost side by side the places of worship of four different denominations, including the city’s only surviving Jewish synagogue. 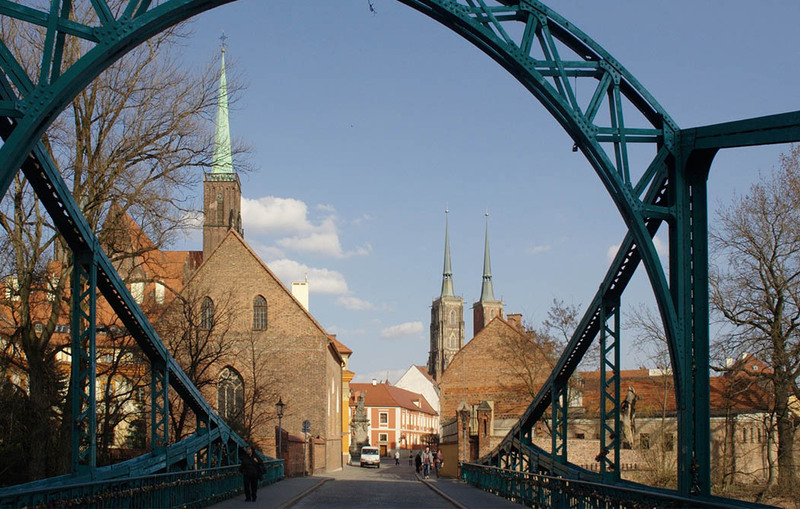 The Old Town may be the heart of Wrocław, but its soul is in Ostrów Tumski. 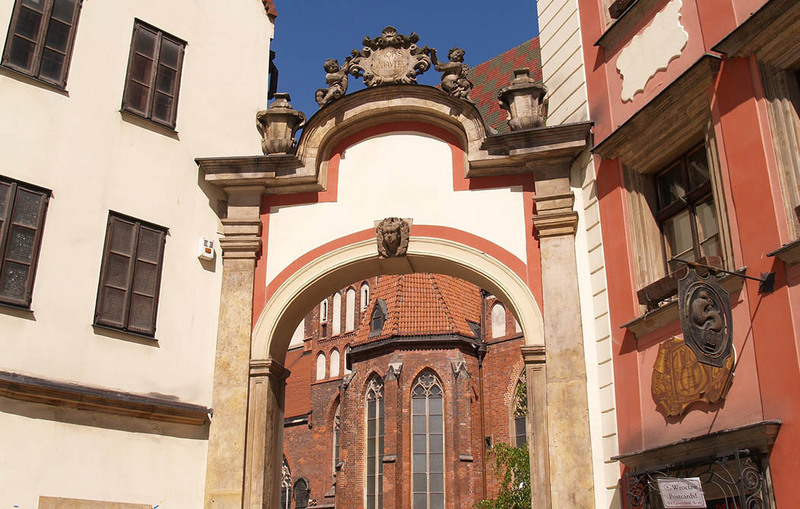 This ‘Cathedral Island’ within easy walking distance northeast of the market square was the first part of Wrocław to be settled by Slavic tribes in the 9th century. 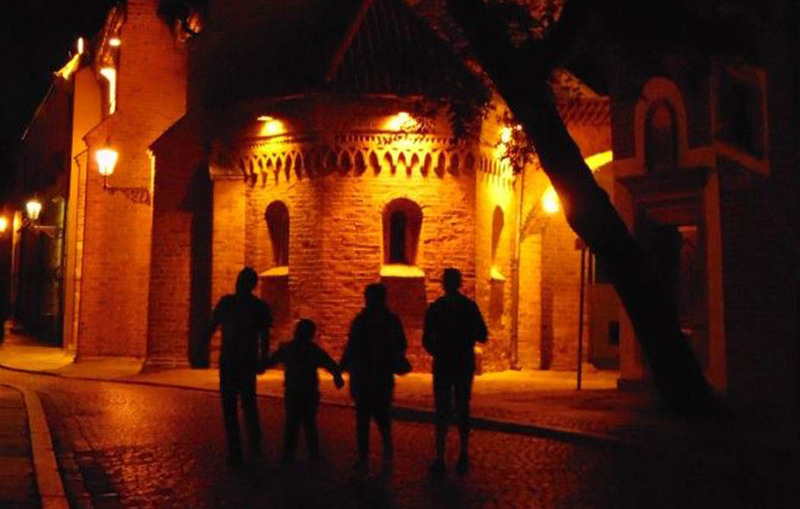 Since a bishopric was built there in 1000AD it has remained an important place of royal and religious significance, and home to the city’s most important Cathedral. 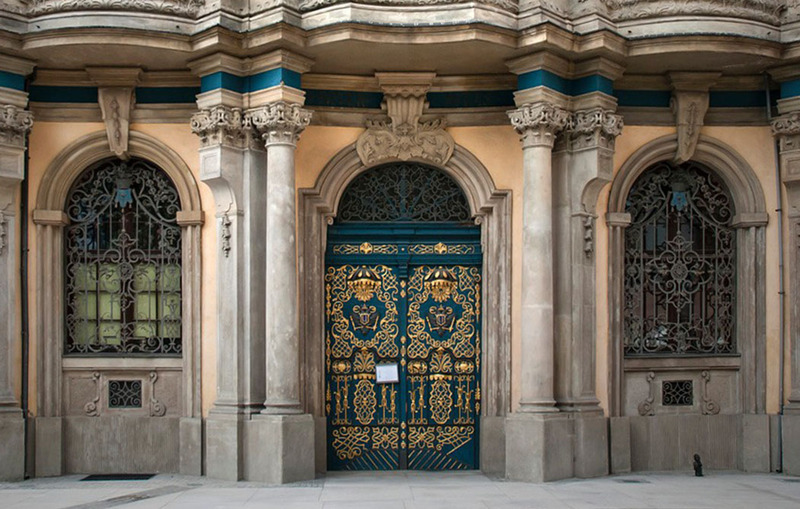 Finally, no visit to Wrocław is complete without a trip east of the Old Town to Centennial Hall. 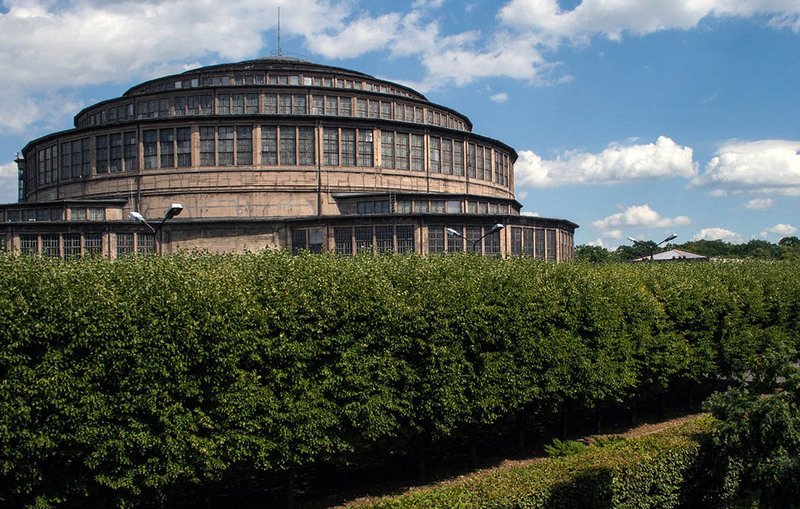 The city’s only UNESCO World Heritage site, this outstanding piece of architecture turned 100 in 2013 and is surrounded by beautiful parks and gardens, including Wrocław’s Zoo and a spectacular multimedia fountain (which turns into an ice rink in winter). 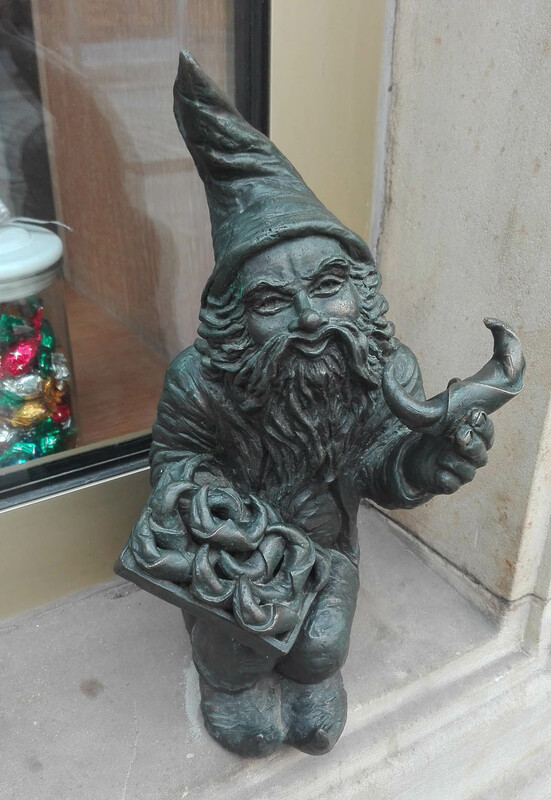 Wrocław’s dwarfs are small figurines that first appeared in the streets of Wrocław, Poland, in 2005. 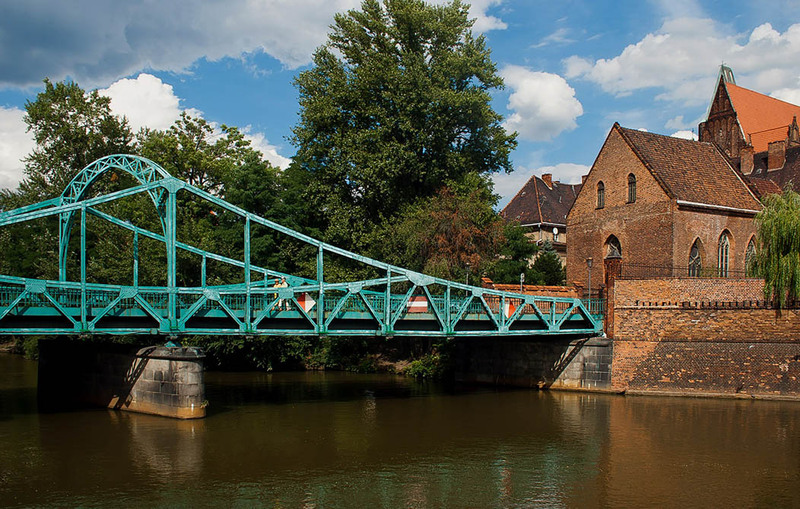 Since then, their numbers have been continually growing, and today they are considered a tourist attraction: those who would like to combine sight-seeing in Wrocław with "Hunting for dwarfs" are offered special brochures with a map and mobile application software for smartphones. 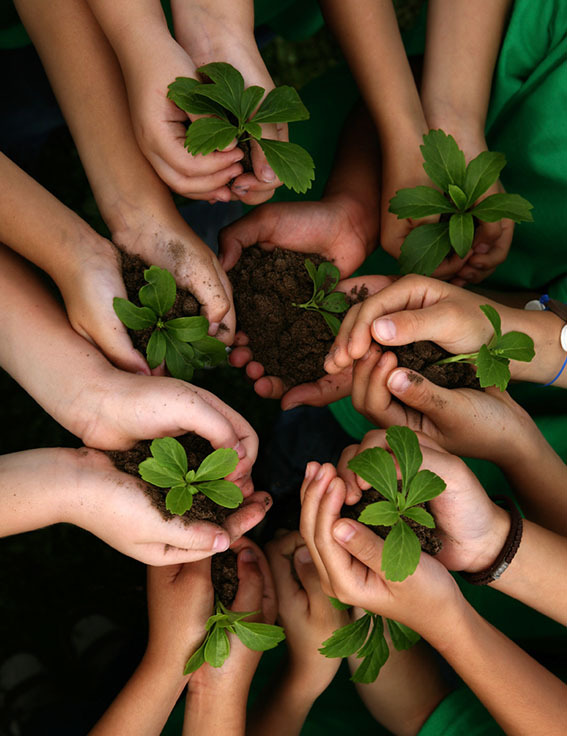 The EVS is a Working Group of the International Association for Vegetation Science. 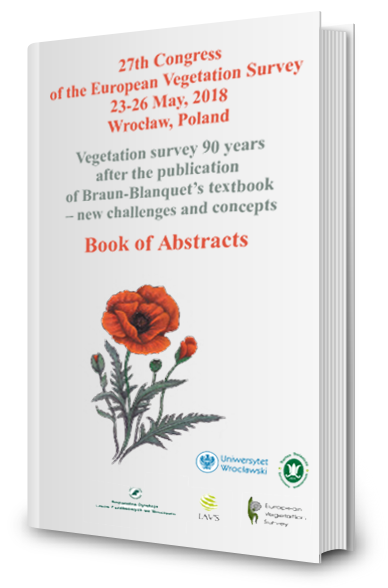 If you require an official letter of invitation to attend the Congress, please contact soon the secretary of Organising Committee, Department of Vegetation Ecology, University of Wrocław, 63/77 Przybyszewskiego, 51-148 Wrocław, Poland; e-mail: ewa.stefanska-krzaczek@uwr.edu.pl. This letter is only for obtaining embassy visa or other specific issues and does not represent any commitment on part of the organizers to provide financial support for you. The deadline for registration and abstract submission has expired. If you are registered for the conference and you have not submitted your abstract yet, please contact the secretary of the conference ewa.stefanska-krzaczek@uwr.edu.pl. Payment must be done by bank transfer to the bank account indicated below. All bank charges for remittances are to be borne by the participant. As soon as you make the bank transfer, please send proof of payment (pdf format) to ewa.stefanska-krzaczek@uwr.edu.pl. In addition, students must send a document proofing this to the same email address. Time: 15 minutes (10 + 5 for questions). Only one presentation per author is allowed. Each abstract cannot exceed one page (approx. 2500 characters with spaces in total).